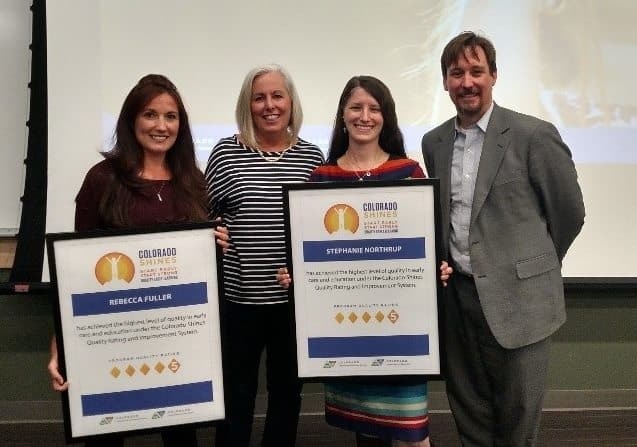 Last week, an event was hosted by the Colorado Office of Early Childhood to honor the first two family child care home providers in the state to achieve a level 5 Colorado Shines rating. One of these accomplished programs is Fuller Child Care, owned and operated by Rebecca Fuller, who is an ELV affiliate and Quality Child Care Partnership program site. 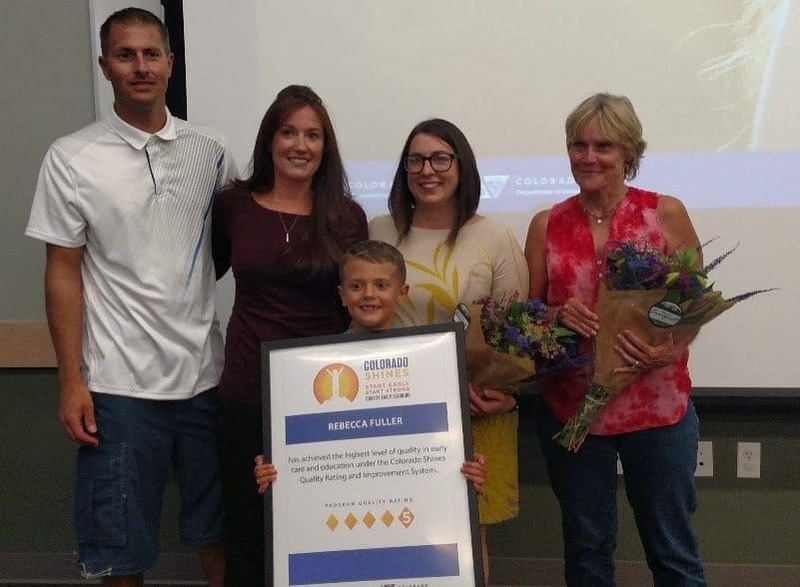 This 2-hour event honored the two family child care programs with a presentation of a plaque as well as highlighted the Office of Early Childhood’s Race to the Top grant and the new Colorado Shines Rating System. This is such a huge accomplishment as these two programs are the very first family child care homes in the state to attain this high rating, which is Colorado Shines’ highest rating level! Rebecca Fuller started her licensed child care business in 2008 when she was unable to find child care for her own child. She was managing a salon at the time and had no idea how difficult it was to find child care. When she found out all the local child care programs were completely full, had to quit her job to stay home and take care of her kids. “It turned out to be the surprise career I never knew I always wanted,” said Rebecca. “I love getting paid to play and educate children all day,” she added. Pictured: State of Colorado Office of Early Childhood Director Mary Anne Snyder and Deputy Director Brian Conly with 5-Star rated family home child care provider owners Rebecca Fuller and Stephanie Northrup. Rebecca has been extremely successful in creating the highest quality environment for the children in her care, and we know that kind of commitment takes dedication and a lot of hard work, so we are so proud to be partners with Rebecca and to watch her serve as a positive role model and teacher for the children she interacts with each day. Rebecca made sure to note that the coaching support of Early Learning Ventures and the Early Childhood Network as well as the business support services from ELV and the investments in Health & Safety into her program from ELV’s Quality Child Care Partnership program, helped her in achieving this high honor. “The continuous coaching from Kelly (ELV) and Joni (ECN) helped me identify areas for improvements and built up my confidence for licensing reviews, so I knew I was so ready before the review even began,” said Rebecca. She also notes the support and resources ELV provided her program (through Quality Child Care Partnerships) to improve the safety of her child care environment, create more shade for sun protection, and brought in more math and science materials to aid in the educational component of her ECE curriculum. Rebecca was also one of ELV’s first sites to sign on to participate in the Healthy Options for Preschoolers program, committing to serve healthy snacks to the children in her care. Finally, Rebecca said her program has benefited tremendously from ELV’s Alliance CORE child care management system. “Having all of the forms for parent check in right there in one easy to access place, and being able to quickly and easily pull child attendance records is absolutely amazing!” Rebecca said. She also takes advantage of ELV’s online education trainings to ensure she is always knowledgeable and up to date on safe and healthy child care practices. Overall, ELV is so proud of Rebecca’s accomplishments. She is truly the gold standard of what a safe, healthy, and enriching child care program should be, and we could not be more proud to partner with her!